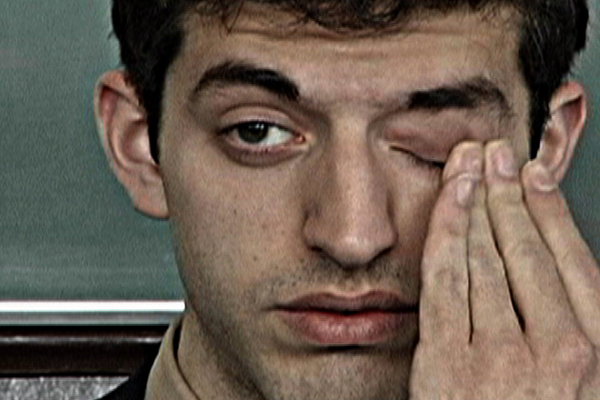 Richard Foreman, Once Every Day, 2012, digital video, color, sound, 67 minutes. Once Every Day, Foreman’s first feature since Strong Medicine (1978), translates the maverick director’s theater of metaphysics into cinema. A film that effectively stages an image of film, wherein actors are posed and fed lines as Foreman’s voice guides them through each motion, Once Every Day makes for a fascinating talking point as Foreman transitions his vision from stage to screen. Long past its heyday as an oil town, Yumen, in China’s Gansu province, is the subject of the eponymous film by Sniadecki (who also codirected the masterful People’s Park), Huang, and Xu. Fusing documentary and staged scenes in a manner reminiscent of Godard from the 1970s onward, Yumen brings dignity and beauty to a place that lies in near ruins, and was the finest piece of cinematic portraiture I witnessed at this year’s Berlinale. For those yearning for more traditional documentary, Ken Loach was on hand with The Spirit of ’45, a history of the labor movement in Great Britain. Through interviews with subjects from all walks of life, the story of the country’s tragically short-lived experiment with socialism resonates with today’s ground reality, as post-Thatcherite Britain increasingly becomes a space reserved exclusively by and for bankers. Paul Bowles opened his cage door to fan Daniel Young for an interview shortly before his death in 1999; with the addition of the likes of Gore Vidal and John Waters, the resulting Paul Bowles: The Cage Door Is Always Open makes for an adept and confident debut, suavely exploring multiple facets of the perennial expat’s life without getting too mired in the details. Perhaps the film’s greatest strength is its simultaneously excavation of the tumult with his wife and fellow writer, Jane Bowles, whose death he may or may not have contributed to. Finally, I managed to sneak into a European Film Market–only screening of Camp 14: Total Control Zone, about Shin Dong-hyuk, the only prisoner known to have escaped from one of North Korea’s harshest secret labor camps. Well known to readers of Blaine Harden’s acclaimed Escape from Camp 14, the film adds fabric to the story’s texture through interviews with former camp guards who oversaw and participated in the torture and murder of prisoners. Watching the film next door to the site where they Nazis engineered their own network of death, Camp 14 was a sobering reminder that progress, in our world, is still an illusion. The 63rd Berlinale ran February 7–27, 2013.